The Egyptian Pound was introduced as the currency of Egypt in 1834. 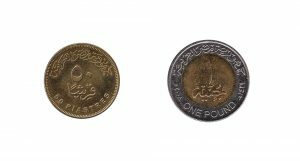 One Egyptian Pound is divided into 100 piastres. The currency unit ‘pound’ exists in many countries with historical ties to Britain, like the former British protectorate of Egypt, currently the Arab Republic of Egypt. We exchange both current and withdrawn Egyptian Pound banknotes. We also exchange Egyptian pound and piastre coins. Our online exchange service is quick, easy, secure and free of charge.